I love fall. It is my favorite season. To kick off Back To Blogging at The SITS Girls today, Roxanne and Tamara have asked for a fall bucket list - all the things we want to do in the next three months to celebrate fall. Unfortunately, I live in a place that knows no fall. Orlando, Fl. Our leaves don't change. Our air does not get cool. There are no corn mazes, and pumpkin patches tend to happen in parking lots with sad pumpkins lined up on pallets. The closest we get to fall is buying a cinnamon broom at the grocery store. This is why I have to break out my Pretend Fall Survival Kit. It is an essential tool for those of us living in southern states who yearn for the beauty and wonder that is fall, but are missing out on the required crisp, cold air to bring it about successfully. Hats - Knit hats. Wool hats. Hats with buttons. Hats with ribbons. Hats are essential for giving you that fall feel. Fall Books - Anne of Windy Poplars always makes me feel like fall is in the air. Fall TV & Movies - My family watches all the episodes of Gilmore Girls with changing leaves when we want to pretend it is fall. In movies, When Harry Met Sally has great fall scenes in it, and so does Stepmom. You've Got Mail also has some beautiful fall moments, including the line "bouquet of sharpened pencils" if you are willing to overlook the fact it is the movie that kills dreams. For other fall fun, and a movie that also is very much about pencils, check out The Odd Life Of Timothy Green, which is one of our new fall favorites. Fall Scented Candles - Pumpkin Pie. Apples and Cinnamon. Apple Pie (any pie scent is great for fall). Spiced Cider. Frosted Cranberry. Leaves. Vanilla Shortbread. Fall-Colored Accessories - You might not have deep, red leaves around you, but you can carry a deep, red purse. Boots - The only shoes I love that aren't flip flops. Scarves - I like to make my own, but that isn't required. You can't have fall, or pretend fall, without a nice scarf. Socks - Not pictured because they are currently on my feet. They are yellow with white stripes, and quite cozy. My friend Tia sent them to me. I've turned the air conditioner down extra cold, because there is no such thing as sock weather in Florida. That's how we pretend fall is here at my house. It works pretty well - as long as we don't actually walk outside very often. 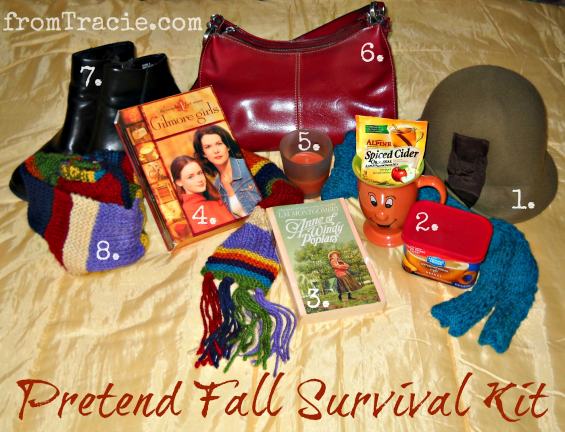 What would you put in a (Pretend) Fall Survival Kit? I love it and wish I could do an imaginary kit, but sadly I am in NY, where it is definitely fall and winter isn't far behind now most likely either! Stars Hollow! It's always fall in Gilmore Girls, right? Hot coffee and hats. I'd get someone who lives in New England or the midwest to send me a GIANT box of colorful leaves. Enough to make a pile to jump in. This is great! I live in Chicago where it has already been Fall for about 3 weeks now. I love EVERYTHING about Fall, with the exception of the cold. One day, I will live some place warm. What a cute idea! Love they Fall Bucket List! Have a fabulous week! I live in southeast Alabama and we don't really have fall either. Never thought about have a pretend kit. This is too cute! I totally could have used this growing up in Florida.. it's just not the same down there! I too wish my list was imaginary. But it's not. And I forgot all about the fall scenes in When Harry Met Sally. This sounds like our "survivor" list :). I used to love watching Gilmore girls - still a little obsessed. I sometimes wish I lived south. But I'll embrace it as best I can on those freezing cold days that splatter freezing rain turning into snow... and the overhead of grey that lingers for months it seems. I live in Tampa, so I hear you on the lack of fall! That's a great Fall Surival Kit, though! I'm in Los Angeles and I'm definitely going to watch the Gilmore Girls so I can feel like it's fall! This is by far my favorite fall bucket list on the link up! lol At least when you have pretend fall, you can leave stuff out of the fall survival kit that's less than pleasant, like a snow shovel or the cold/allergy medicine! :) Enjoy your fall-less fall! That is a pretty good fall survival guide. Our leaves are just starting to change colors and I cannot wait for all things fall to take place! Since I completely missed the challenge this week (ARGH!) I will be writing my Autumn Wish List (or something similarly titled. Want it to be proactive but stuff based on kicking the bucket doesn't sit right with me!) Anyway - I am in Bakersfield where we may get an entire weekend under 90 degrees. I'm excited about this! LOL. Great to read you, always. Great list- fall candle scents are the best! My Fall Survival Kit would definitely have gift cards to Starbucks so I can buy their Pumpkin Spice Lattes!